The House of Representatives voted to pass the USA Freedom Act on Wednesday, approving a bill that would change the way the National Security Agency gathers telephone data of American citizens. The bill now heads to the Senate. The USA Freedom Act was passed overwhelmingly with 338 votes in favor and 88 against. Despite criticism that the legislation falls short of protecting Americans’ rights, the bill was approved without any amendments. Under the bill, the NSA would be prohibited from collecting telephone metadata under the Patriot Act. Instead, the agency would have to acquire a warrant every time it wanted to access phone records, which would be held by telephone companies. Officials would need to submit data requests via keywords in order to collect relevant data from companies. The bill would also reform the Foreign Intelligence Surveillance Court (FISA Court) by setting up a five-person panel that would offer advise when intelligence agencies are seeking new interpretations of existing law. Some court rulings would need to be declassified. It's unclear whether or not the bill has the support to make it through the Senate. Majority Leader Mitch McConnel (R-Ky.) has promoted the idea of simply extending the Patriot Act, but Senators Ron Wyden (D-Ore.) and Rand Paul (R-Ky.) have both threatened to filibuster any bill that doesn't reform the NSA in some way. Rep. Jim Sensenbrenner (R-Wis.), the original author of the Patriot Act, had previously called the Freedom Act an improvement on current law, particularly since he never intended for the NSA to use the Patriot Act to conduct mass surveillance. 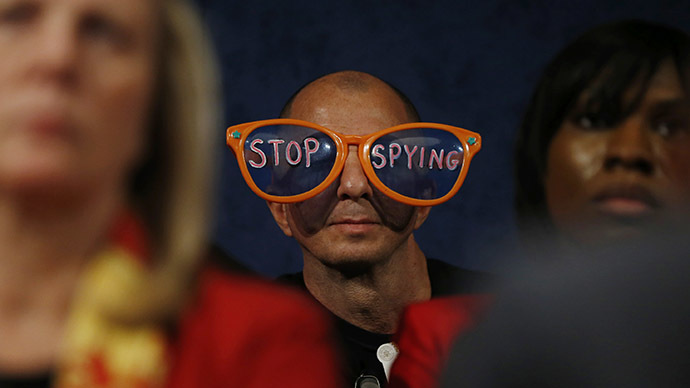 However, privacy advocates have criticized the bill for not reining the NSA in further. The Freedom Act ends the NSA's bulk collection of telephone metadata, but it does not address the agency's online surveillance or other controversial programs. A recent ruling by a federal appeals court also found that the NSA is not authorized to collect telephone data under the Patriot Act, bolstering lawmakers and organizations who want to see stricter limits placed on the agency. In fact, the digital rights group Electronic Frontier Foundation rescinded its support for the Freedom Act this week as a result of the ruling, arguing that more needs to be done. Representative Justin Amash (R-Mich.) also called for reverting to the 2013 draft of the bill, arguing that the current version actually authorized bulk collection of Americans’ data. “HR 2048 falls woefully short of reining in the mass collection of Americans’ data, and it takes us a step in the wrong direction by specifically authorizing such collection in violation of the Fourth Amendment to the Constitution,” Amash wrote on his Facebook page. Today, you will read all sorts of stories and tweets about how #USAFreedomAct ends "bulk" collection. It doesn't: https://t.co/xtuUZ47B0I. The bill does this by giving the government authority to order the companies to turn over the data based upon a “specific selection term,” like a keyword used in the search engine, he explained. Using this language, nothing in the bill appears to prevent the government from having a provider turn over all of their records for all of their customers in a certain state, for example. “Only a politician or bureaucrat wouldn't call that ‘bulk,’” wrote Amash.